Tom had been having all the fun, and was just five birds away from his target of seeing 300 birds before age 30 (6 weeks to go); meanwhile, I have been languishing at my desk or in the lab, and had only managed one new species since January. In fact, I’ve barely been birding at all. So after watching all of Tom’s lovey reports from his trip to the Scotland (and having had some stress-related health hiccoughs) I decided that a spot of birding was in order. Of course, I am dead-keen that Tom hit his birthday birding target, so I suggested that we spent last Sunday with the birds. I’d head over to his place on Saturday night, and we’d head out from there in the morning to where ever seemed to hold the best birds. Having a scan through the reports on Saturday evening, we decided on the Minsmere Savi’s warbler (which would be a lifer for both of us), followed by a thorough sweep of the Suffolk/Norfolk border to scoop up whatever else we could get. A good two and a bit hours each way… and back past my house too… ah well, you can’t plan for everything. So now all we had to do was wait til morning. Tom employed his time by driving to Belper and taking part in an epic stand-up gig. I stayed, crashed, at the flat, enjoying a fantastic migraine which felt like icepicks were being pressed into my left eye and nostril. The only benefit to this was going to bed at seven, sure of a good night’s sleep before our 4 am wake-up call. When four A.M. rolled around, my migraine had subsided to a mere headache. I’d taken my meds and grabbed last night’s pizza and was ready to drive. The drive is one of the best bits of birding with a stand-up comedian, old jokes mix with new as we try and keep the car in its lane through laughing fits. At the services I we amuse the woman at the checkout as I loudly abandon Tom whilst he pays for his sandwiches, announcing that I’ll be in the car cramming my newly purchased nurofen into my face. Then we’re off again, finally rolling into the Minsmere carpark at seven. Leaving the car we head for Island Mere hide, where the Savi’s had been heard the previous day, checking with the locals we pass en route for the best spots for stone curlew (one of my targets for the day). The reed beds are swarming with reed and cetti’s warblers as we wander down the boardwalk to the hide, and then it begins; the tedium of a warbler twitch. It’s not singing, it's in dense cover, and all we can do is wait. Having said that, there are many, many worse places to wait than the Island Mere hide at Minsmere. Marsh Harriers quartered the reed beds and a bittern boomed away. An otter was beset by angry mute swans. A lone common tern aggressively chased away the Med and Black headed gulls which occasionally alighted on the water. Off course, my camera battery had been neglected in the head crushing pain that was the previous evening, so I was sparing with my pictures. We were in the hide for an hour and a half, chatting to the locals, and I was starting to get twitchy… I could feel the day ticking away, and knew that Tom had to be back by 6:30… Other birders had come and gone, and I was considering suggesting that we move too; then the reeling began. Thank god. We listened to the bird calling for five minutes and were rewarded with a brief glimpse of it flitting from cover. 249 for me, 296 for Tom. A brief high five and we were off in search of stone curlew. As we wandered seaward toward North Wall and the resident breeding pair we were treated to fantastic views of a stoat moving its kits, more mewing Med gulls, and a quick pit stop at the cafe. 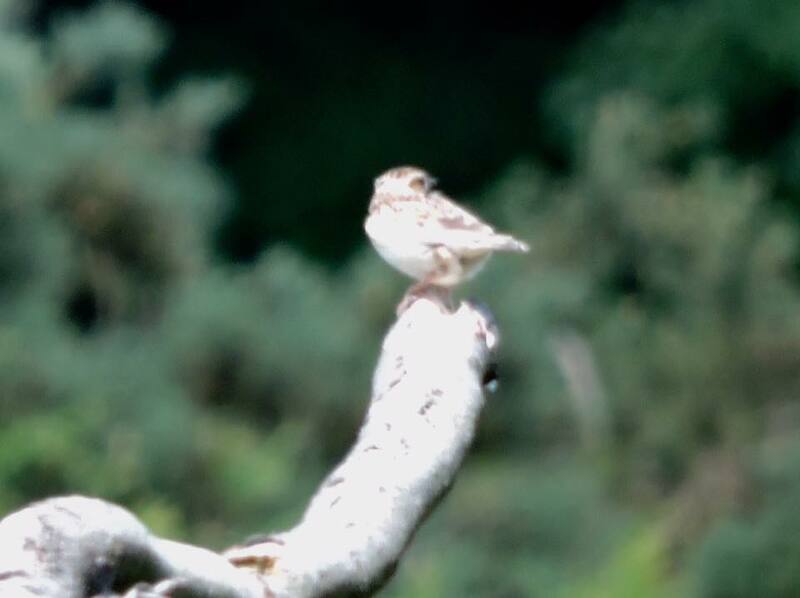 We were also given some local intel on the woodlark at Westleton Heath. Arriving at the fenced “St-urlew” nest site we scanned with scope and bins to try to find the elusive birds, our hopes soaring when a couple announced that they had found them. Unfortunately it turned out that they were stringing a couple of red legged partridge, and we gave up and bundled in the car to head to Westleton. When we got there it was roasting… however, I managed to bag my first tick not five minutes from the car. Turtle doves “turring” in the trees by the path. We were lucky in seeing one bird flying out over the scrubby gorse, landing in a sycamore, where it was instantly invisible. 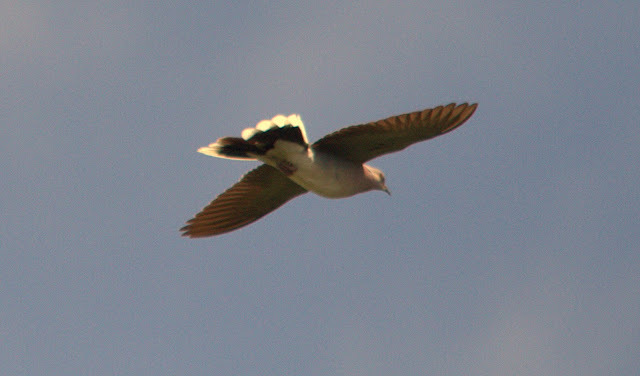 I got a couple of terrible shots and my 250th bird. From here we forged out onto the heath, following the wooded field margin for best chance of woodlark. After an hour’s walking we were hot, bothered and beginning to lose heart. We’d covered almost all the available ground and began to double back for the car. Coming back through a kissing gate I caught a glimpse of something perched on a bare branched of a fallen tree. The offending article. Tom managed a quick, if blurry, shot and I watched through bins for a minute until the bird flitted. We waited, but the bird failed to reappear, lost in the gorse. We wandered back to the car as happy as you like, three for three on our targets. 251 for me, 297 for Tom, a great day all round. Feeling pretty confident, we decided to try and get me those elusive stone curlew, deciding to detour to Weeting Heath on the way home. Cheerfully we gossiped in the car for an hour, planning trips in the next six weeks to ensure Tom hit his 300, and we soon pulled up in the carpark. 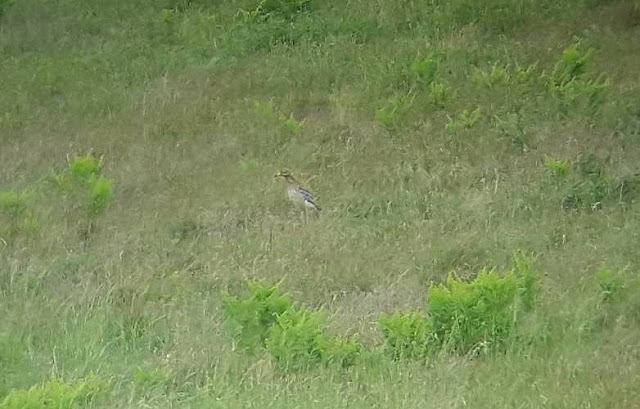 The centre was locked and we headed toward the North Hide, stopping to talk to a couple who were scanning the fields the far side of the road… who had their eye on a pair of stone curlew and their chick. One of the quickest ticks I have had. 252. One adult and the juvenile were out in the open, the other was half in cover. The angle of the far field gave us excellent views (although the pictures are still awful) and we watched the birds for around half an hour. Heading back to the car we checked the time. With our amazing luck so far we had a few hours in hand, and we checked the reports in hope of a last minute miracle. There was an obvious choice… despite living up in Scotland and making regular trips up and down the west coast, I had failed to connect with corncrake. Fortunately, one had appeared in Warwickshire, just 15 minutes from Tom’s house. Depending on the traffic, it could have been on. It was a focused drive back, with one eye permanently on the clock. We pulled up to Alvecote Pools just as Tom’s phone battery gave out, we had forty mins to connect with the bird. Fortunately there were a few birders on site. They reported hearing the bird not five minutes before, and we settled in to wait. Turned out that luck was on our side again, and within a few minutes there was a clear “crexing” from the iris bank in the field bottom. Five for five, and thirty minutes to get Tom to work. We bundled into the car and, thirty minutes later, I was happily wending my way back along the M6 toward home. I may not have many chances to go birding any more, but I can be happy in the knowledge that occasionally my luck holds out. Not only that, but in the next six weeks before Tom’s birthday I have at least one more tick on the cards, so watch this space.